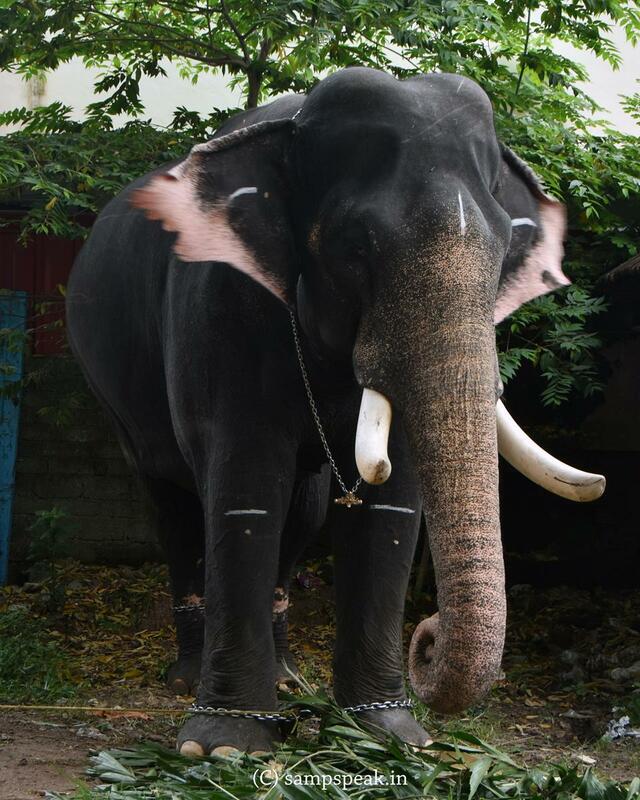 "Sampath Speaking" - the thoughts of an Insurer from Thiruvallikkeni: Cognitive ability ~ is Elephant a person ? Aranmula kannadi is a handmade metal-alloy mirror, made in Aranmula, in Pathanamthitta district of Kerala. Here is the beautiful temple of Sri Parthasarathi ~ a divyadesam (Thiruvaranvilai – locally Aramula). Unlike the normal "silvered" glass mirrors, it is a metal-alloy mirror or front surface reflection mirror, which eliminates secondary reflections and aberrations typical of back surface mirrors. They are considered to be one of the eight auspicious items or "ashtamangalyam" that play a role in the entry of the bride at a wedding venue. The origins of the Aranmulakannadi are linked to the Aranmula Parthasarathy Temple. People spend long time in front of mirrors – and at the first instance, one would look to see whether the looks are attractive and needs any correction like combing or make-up – this is but natural for humans (read women). Do animals react in the same manner ?The mirror test – sometimes called the mark test, mirror self-recognition test (MSR)– is a behavioural technique developed in 1970 by psychologist Gordon Gallup Jr. as an attempt to determine whether an animal possesses the ability of visual self-recognition. The MSR test is the traditional method for attempting to measure self-awareness. However, there has been agreement that animals can be self-aware in ways not measured by the mirror test, such as distinguishing between their own and others' songs and scents. In the classic MSR test, an animal is anaesthetised and then marked (e.g., painted, or a sticker attached) on an area of the body the animal cannot normally see. When the animal recovers from the anesthetic, it is given access to a mirror. If the animal then touches or investigates the mark, it is taken as an indication that the animal perceives the reflected image as itself, rather than of another animal.Very few species have passed the MSR test. The most forlorn-looking elephant, ironically named ‘Happy’ caged alone at the Bronx Zoo is also the first elephant to demonstrate self-awareness via the mirror self-recognition test (MSR). Jane Goodall, Steven M. Wise and the legal team at the Nonhuman Rights Project (NhRP) secured another first for the sad elephant becoming the first elephant to be granted a Writ of Habeus Corpus, before the Orleans County Supreme Court. For a decade the NhRP has used the legal pathway of Writ of Habeas Corpuson behalf of nonhumans, making the case that elephants and other self-aware, cognitively advanced beings are not ‘things,’ they are not merely ‘property’. To them, it is wrong to treat animals as if they're basic, inanimate beings. The Asian elephant ‘happy’ 47 years of age, has remained caged alone for more than a decade at the Bronx Zoo. A writ filed by humans on behalf of other highly intelligent species is the only viable recourse for creatures like elephants who can neither legally, nor practically, plead their case before a judge in court.“Our world-class experts say that, like all elephants, Happy is an autonomous being who evolved to walk 20 or more miles a day as a member of a multi-generational large social group,” said Steven M. Wise, via NhRP press release. “The entirety of the zoo’s elephant exhibit provides far less than even one percent of the space she would roam in a single day in the wild. She doesn’t belong to a social group. Her autonomy is thwarted daily. This has got to stop.”Once used as a pathway to freedom by slaves, a writ of habeas corpus (known as the Great Writ) sets a precedent for all future considerations of the rights and freedoms for intelligent beings, be it animals, aliens or artificial intelligence. Director of the Bronx Zoo and Executive Vice President of Zoos & Aquarium at the Wildlife Conservation Society said - “The NRP has chosen to exploit Happy and capitalize on the Bronx Zoo name to advance its failed political agenda. They continue to waste court resources to promote their radical philosophical view of “personhood.” The NRP’s own filings do not question Happy’s care or our facilities, but seek to have her recognized as an autonomous being and transferred to an elephant sanctuary. “We are pleased our motion for change of venue to Bronx County was granted, and we are confident that the courts will continue to do the right thing in this matter”, said the litigant. With views and counter-views the position of Happy does not seem to have resolved in any manner.